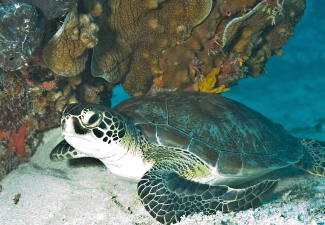 Some of the bay wildlife at Biscayne National Park, this particular fellow a green sea turtle. Image courtesy National Park Service. Boat Tour (peak season weekends) - $39 adult, $29 youth, Free 4 and under. Various others available. There is a $25 per night fee for camping (boat access required)from October to April. Fees waived during off season. Fees subject to change without notice. This is Miami on the Atlantic Ocean, so expect warm summer weather and a good amount of rain. Although the winter, high visitor season, has less rain with high temperatures in the seventies to low eighties and lows in the sixties. Summer weather will reach in the nineties during July and August. Be cognizant of weather any time you are near or on the water; pay attention to the local reports, rangers, and your surroundings to remain safe. Bring appropriate gear and supplies. 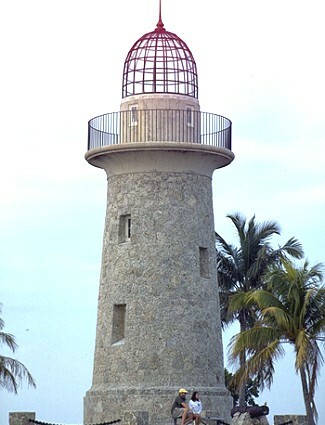 Photo above: Boca Chita Key lighthouse at Biscayne National Park. Right: Sunset in the park. Source: National Park Service. Water, water, everywhere, and not a drop to drink. Well, that's not quite true, of course, but at Biscayne National Park, it sure is water water everywhere, with a boat to make your trip and visit complete. This is a huge park, of water. Over 95% of the 172,000 acres are water. And while you can enjoy your stay here in the land of brine and pirates while not venturing out into it, a visit to Biscayne National Park may not really be complete without your ability to wander, if not into the wet, then above it. Over 10,000 years ago, the Paleo-Indians made their way down the Florida peninsula to Biscayne. At that time, the Florida Peninsula might have been twice as wide and the area of Biscayne more a savannah than bay. Thousands of years later, the Tequesta would be the indigenous people of Biscayne Bay, until European settlement began in the 1600s, causing their demise. It would come to the tribes of the Creek from Georgia to inhabit this land later, giving rise to the Seminole and Miccosukee. But there was more to the inhabants of the Biscayne Park area than pure Indian and European history. Porgy Key and Toten Key tell the story of African Americans and the Jones Family in the Jones Family Historic District, where they parlayed an investment of $300 ($5 per acre) into $1.5 million. 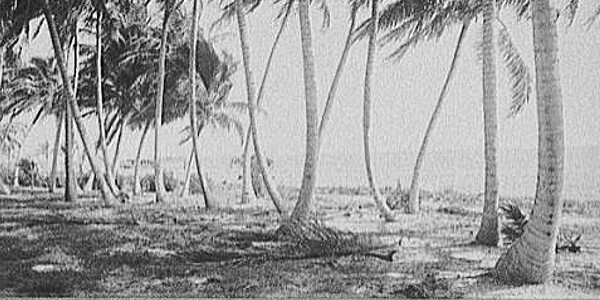 Photo above: Biscayne Bay through the coconut trees, early 1900s. Source: Library of Congress. 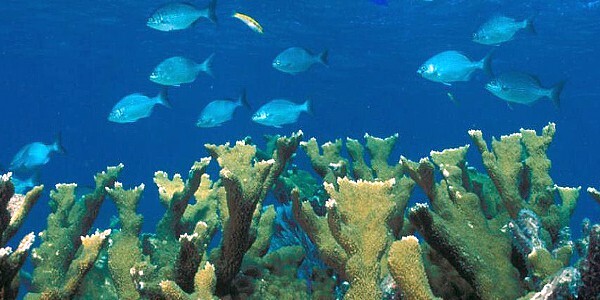 Below: Marine life along one of the coral reefs of Biscayne National Park. Source: National Park Service. Today, you can travel the water of Biscayne National Park and conjure up the lives of the past, whether back in time to Ice Age days or those pirate ways. This is a relatively new park, established by President Johnson in 1968. There are a number of ship wrecked vessels below the surface here, including ... Arrratoon Apcar at the Fowley Rocks, plus Lugano, Mandalay, Erl King, and Alicia at Long Reef. More than forty were lost in these waters. There are a number of keys to visit; Boca Chica, Elliot, and Adams the best known, Sands Key plus the Jones Family story at Totten Key and Old Rhodes Key. On the land side, you can visit the main Visitor Center area at Convoy Point, plus Miami-Dade county parks at Black Point Park and Homestand Baypoint Park. Bring your smile, bring your adventureous spirit, and accept the possibliity that you might just get wet, and that's just what you want to be. 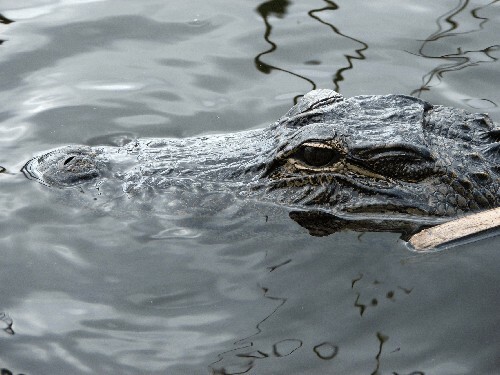 The first thing you'll notice about Biscayne National Park when you venture toward the visitor center or the water, is the plethora a wet nature that abounds and the things you can do to view it. There are four ecosystems in the park; shoreline mangrove swamp, shallow bay waters, coral limestone keys, and the Florida Reef. Boating, camping, bird watching, learning about history, hiking, diving, canoeing, and a whole lot more is there for the taking within those systems. The area around Biscayne has been hosting visitors and residents for years. Yes, at one time, those visitors were unwanted pirates. At others, they were Presidents like Hoover and Nixon. Even more inhabited and visited the Stiltsville area for the Bikini Club and Quarterdeck Club where they could imbibe and gamble during illegal times. What, there was gambling near Miami? Who knew? 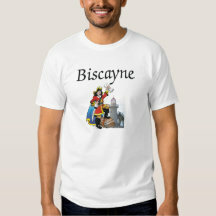 Biscayne National Park T-Shirts and Souvenirs from the official merchandise of America's Best History. Great for your next Atlantic Ocean adventure or to remember one your last Miami vacation. 1. Bring your boat and glide across the water. While there are no boat launches in the park itself, there are four marinas just outside the park that service craft. Herbert Hoover Marina (near the Visitor Center), Black Point Park and Marina, Matheson Hammock Park Marina, and Crandon Park Marina all provide access to the park, although the final two are further away. All can become crowded during peak times. 2. Watch the 11 minute film, Spectrum of Life, at the Convoy Point Visitor Center. It will get you involved in the nature of the park, even before you venture out into it. 3. 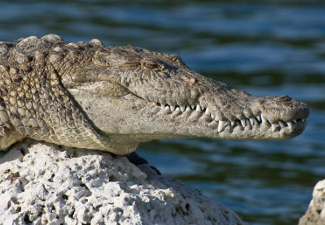 Perhaps the best way to see the park, if you don't have your own boat, is to take the Biscayne National Park Boat tour. The tour includes a two and one half hour guided tour of the park, including the islands and lighthouse, on a 45 foot catamaran, the Pelican Skipper. It may be a bit pricey for a family, $29 per adult, $19 per youth, four and under free in 2016. But you'll get out on the water and see what Biscayne is really all about. The tours run during the peak season on Fridays, Saturdays, and Sundays, once or twice most days. Check with the Visitor Center for the specific schedule. Photo above: Boca Chita Key at Biscayne National Park. Courtesy National Park Service. Dante Fascell Visitor Center at Convoy Point - If you're at Biscayne for the first time, this is the place to start. Exhibits in the museum, a bookstore, several films, art gallery, and ranger orientation will help you get your drift of the water filled park. Adams Key - A day use area island, once home to the Cocolobo Club, a retreat for the famous and presidential. You can hike and picnic here. Boca Chica Key - This islands includes a lighthouse built by Mark Honeywell in 1937. It's decorative, not operational, and never was. There is a half mile walking trail here, and a campground for tents. Elliot Key - The largest island in the park, Elliot Key was once the site of pineapple farming and other commercial pursuits. Today, it has picnic facilities, walking trails, a place to wade and swim, and a campground. The Visitor Center at Biscayne National Park can be reached off the Florida Turnpike or Route 1. Coming from the north using the Florida turnpike, take Exit 6 (Speedway Boulevard) off the Florida Turnpike, turn left, south, to North Canal Drive, 328th Street, left there for four miles. Look for park entrance. Check your favorite map program for the specific route using Route 1. For those that want to trolley into the park, you can enjoy a ride from Homestead on the Homestead National Parks Trolley, which runs Saturdays and Sundays from late November to April. Photo above: Yes, they've been coming here awhile. The parking lot in the 1950's. Source: National Park Service. 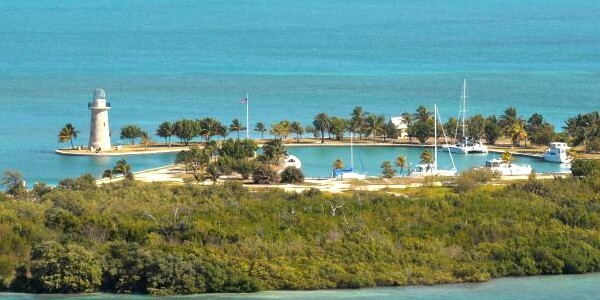 Biscayne National Monument does not have a lot of land, and while there is no lodging per se within the park itself, Biscayne is right next to Homestead and south of Miami, so your lodging choices are many. Check your favorite online lodging site such as Expedia for the lodging type of your choice. 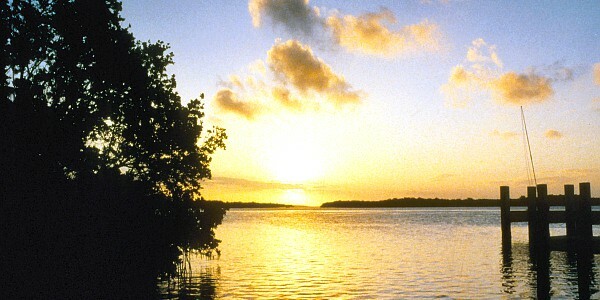 As far as camping is concerned, there are two campgrounds on islands in the park, Elliot Key and Boca Chica Key. Both require boat access. There is a fee during the high season (October to April), but no fee during the low season. Camping is first come, first served. 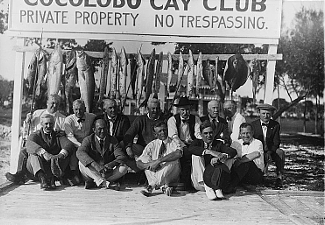 Photo of visitors at the retreat Cocolobo Cay Club, Biscayne National Park, including President Warren G. Harding, circa 1921 to 1923. Image courtesy Harris Ewing collection, Library of Congress/Wikipedia Commons. 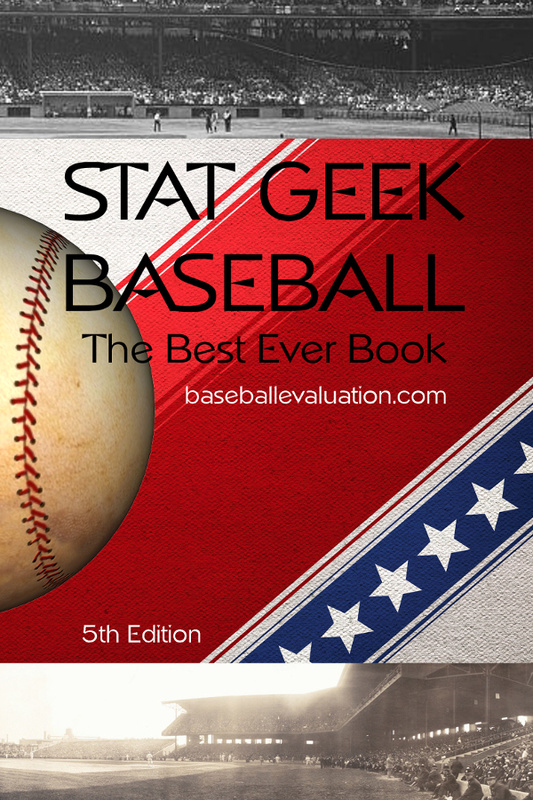 Get Baseball History and Books at Stat Geek Baseball, including Fields of Gold, Baseball's Best Glove Work and The Best Ever Book.